This project will present a new body of work by internationally known photographer Paul Seawright. The show is part of a larger tour, which began at the Culturel Irlandais in Paris before moving to The Model in Sligo. 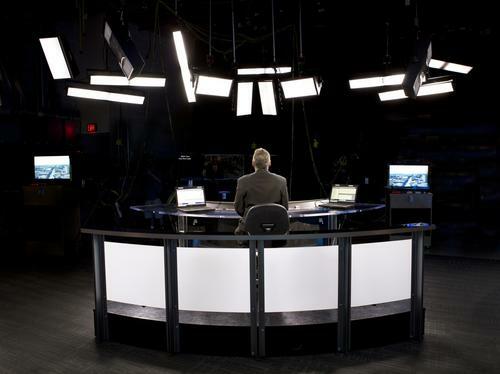 In his most recent work, Seawright investigates the interiors of television studios located in Europe and America. The media, which create the news bulletins about current wars, are intellectually contested spaces. Seawright’s new work is about the intimate narratives of these sites—with a temporal tension between what is being said and what is being understood. Though the space is made to be seemingly unbiased, allowing an attempt to tell the viewer what is truth; it will never be the full truth. Through these abstracted images, the TV viewer and the victims is belied by sensational representation that ultimately distances and desensitises, making for powerful and poignant images. An exhibition catalogue accompanies the show. Seawright is the Head of School for Belfast School of Art and Professor of Photography. He was formerly Dean of Newport School of Art, Media and Design at the University of Wales, Newport, United Kingdom. Seawright was awarded a personal chair by the University of Wales in 2001, and is a Fellow of the Royal Photographic Society, Royal Ulster Academy of Arts and Fellow of the Royal Society of Arts. In 2005, the FotoMuseum Antwerp exhibited a major survey exhibition of his work with accompanying catalogue Field Notes. He is represented by Kerlin Gallery, Dublin.